'Harmonics' as defined by EMC standards refers to harmonics of the 50 or 60Hz mains supply that are imposed on the current drawn from the supply by the product. Most products do cause these 'harmonics' and even though the amount created by each product may be small, the overall effect of many 1,000s on the local electricity supply network causes problems. The EMC Directive now includes limits on harmonics which are mandatory on all products connected to the public mains supply. The standard for products rated at up to 16A/phase is IEC61000-3-2. The AC2000A is fully compliant with this standard and will provide all the measurements necessary to complete the compliance assessment. 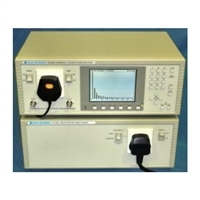 This same instrument, also includes flicker measurements as required by IEC61000-3-3, to include inrush current measurement. The Harmonics standard includes a requirement for the incoming mains to be itself free from harmonic content (<0.1% THD) as this may otherwise affect the accuracy of any measurements. The AC1000A is a clean power source that will provide a pure sine wave with the required low THD for loads up to 1kW.